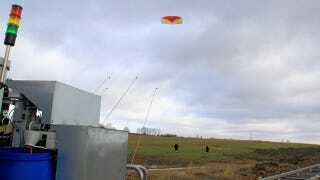 Could stunt kites be the future of wind energy? The idea of harnessing the energy from wind by using ground-based stations linked up to atmospheric turbines is gaining traction. Trouble is, they're expensive, unwieldy, and prey to low winds. Moreover, why go to all the trouble of building massive wind turbines when something much simpler exists? Such is the thinking of German development firms NTS GmbH and Fraunhofer, a partnership that's looking to harness wind energy by sending simple stunt kites into the sky. Stunt kites, also known as sport kites, are controlled by pilots who maneuver them in the air in a manner similar to how cyclists steer a bike — but instead of steering them with handles, the pilots pull on strings. Most standard kites can fly in winds from three to nine mph (14.5 km/hr) and are made from ultra-light materials. Stunt kites can cost anywhere from $50 to $300. But as NTS GmbH and Fraunhofer have discovered, the kites' aerial movements can also be used to power a generator, which then converts the kinetic energy into electricity. To make this happen, the kites are lifted to a height of 300 to 500 meters (about 1,000 to 1,600 feet) and oriented in an optimal way to absorb the strongest winds. Cables then tether the kites to vehicles which are pulled around on a circuit of rails. A generator then converts the kinetic energy of the vehicles into electricity. Compared to conventional wind farming, this approach offers some definite advantages. According to the developers, wind speeds at 500 meters can exceed 20 meters per second (65 feet/second). Wind turbines, which can only attain a maximum height of 200 meters, experience winds which are considerably weaker. In fact, Fraunhofer claims that their stunt kites capture winds twice as fast as conventional turbines, but produce eight times the energy. They calculate that eight kites with a combined surface area of up to 300 square meters can equate to 20 conventional 1-megawatt wind turbines. In addition, winds rarely achieve speeds less than 5 km/h at those heights (resulting in higher reliability and an increased availability of lowland sites), and it costs considerably less to build a system that doesn't require towers each weighting hundreds of tons. Moving forward, NTS GmbH will design the kites and construct the high-altitude farm, while the IPA will develop the control and measuring technology for the cable winching mechanism and cable store. One of the jobs of the control unit will be to maneuver the kite in either a figure-eight or sine-wave flight pattern. These flight configurations could generate a high pulling power of up to 10 kilonewtons (kN) -– meaning that a 20-square-meter kite has the capacity to pull one ton. The companies have already tested a 400-meter-long straight track in Mecklenburg-West Pomerania. Ideally, they'd like to use a total of 24 kites to generate 120 gigawatt hours a year (GWh/year). Putting this into perspective, a 2-megawatt wind turbine produces around 4 GWh/year. So an NTS system could replace 30 2-megawatt turbines and supply power to around 30,000 homes. Source and image: Fraunhofer Inset image: via.